8. It is the simplest polycyclic aromatic hydrocarbon, and is a white crystalline solid with a characteristic odor that is detectable at concentrations as low as 0.08 ppm by mass. As an aromatic hydrocarbon, naphthalene's structure consists of a fused pair of benzene rings. It is best known as the main ingredient of traditional mothballs. 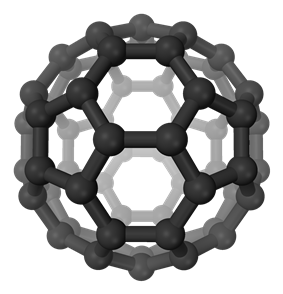 A naphthalene molecule can be viewed as the fusion of a pair of benzene rings. 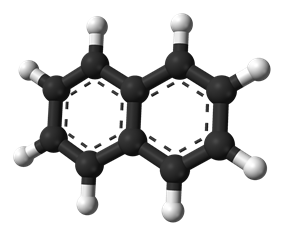 (In polycyclic aromatic hydrocarbon (PAH). There are two sets of equivalent hydrogen atoms: the alpha positions are positions 1, 4, 5, and 8 on the drawing below, and the beta positions are positions 2, 3, 6, and 7. Unlike benzene, the carbon–carbon bonds in naphthalene are not of the same length. The bonds C1–C2, C3–C4, C5–C6 and C7–C8 are about 1.37 Å (137 pm) in length, whereas the other carbon–carbon bonds are about 1.42 Å (142 pm) long. This difference, which was established by X-ray diffraction, is consistent with the valence bond model of bonding in naphthalene and in particular the phenomenon of cross-conjugation. This theorem would describe naphthalene as consisting of an aromatic benzene unit bonded to a diene but not extensively conjugated to it (at least in the ground state). As such naphthalene possesses several resonance structures. Two isomers are possible for mono-substituted naphthalenes, corresponding to substitution at an alpha or beta position. In electrophilic aromatic substitution reactions, naphthalene reacts faster than does benzene. For example, chlorination of naphthalene proceeds without a catalyst to give 1-chloronaphthalene. Likewise, whereas both benzene and naphthalene can be alkylated using Friedel–Crafts reactions, naphthalene can also be alkylated by reaction with alkenes or alcohols, using sulfuric or phosphoric acid as the catalyst. 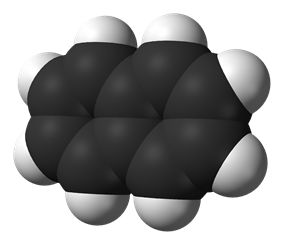 Aside from coal tar, trace amounts of naphthalene are produced by Muscodor vitigenus produces naphthalene almost exclusively. Naphthalene is used mainly as a precursor to other chemicals. The single largest use of naphthalene is the industrial production of phthalic anhydride, although more phthalic anhydride is made from o-xylene. The insecticide 1-naphthyl-N-methylcarbamate (carbaryl). Other useful agrichemicals include naphthoxyacetic acids. Nadoxolol is a beta blocker. Many naphthalenesulfonic acids and sulfonates are useful. Alkyl naphthalene sulfonate are surfactants, The aminonaphthalenesulfonic acids, naphthalenes substituted with amines and sulfonic acids, are intermediates in the preparation of many synthetic dyes. The hydrogenated naphthalenes tetrahydronaphthalene (tetralin) and decahydronaphthalene (decalin) are used as low-volatility solvents. Naphthalene sulfonic acids ae also used in the synthesis of 1-naphthol and 2-naphthol, precursors for various dyestuffs, pigments, rubber processing chemicals and other chemicals and pharmaceuticals. Molten naphthalene provides an excellent solubilizing medium for poorly soluble aromatic compounds. In many cases it is more efficient than other high-boiling solvents, such as dichlorobenzene, benzonitrile, nitrobenzene and durene. The reaction of C60 with anthracene is conveniently conducted in refluxing naphthalene to give the 1:1 Diels-Alder adduct. The aromatization of hydroporphyrins has been achieved using a solution of DDQ in naphthalene. Naphthalene has been used as a household fumigant. It was once the primary ingredient in mothballs, though its use has largely been replaced in favor of alternatives such as 1,4-dichlorobenzene. In a sealed container containing naphthalene pellets, naphthalene vapors build up to levels toxic to both the adult and larval forms of many moths that attack textiles. Other fumigant uses of naphthalene include use in soil as a fumigant pesticide, in attic spaces to repel animals and insects, and in museum storage-drawers and cupboards to protect the contents from attack by insect pests. Naphthalene is a repellent to opossums and could be used to deter them from taking up residency in people's homes. It is used in pyrotechnic special effects such as the generation of black smoke and simulated explosions. In the past, naphthalene was administered orally to kill parasitic worms in livestock. 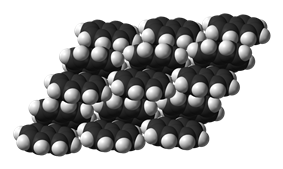 Naphthalene and its alkyl homologs are the major constituents of creosote. Naphthalene is used in engineering to study heat transfer using mass sublimation. Exposure to large amounts of naphthalene may damage or destroy red blood cells. Humans, in particular children, have developed this condition, known as hemolytic anemia, after ingesting mothballs or deodorant blocks containing naphthalene. Symptoms include fatigue, lack of appetite, restlessness, and pale skin. Exposure to large amounts of naphthalene may cause confusion, nausea, vomiting, diarrhea, blood in the urine, and jaundice (yellow coloration of the skin). Over 400 million people have an inherited condition called glucose-6-phosphate dehydrogenase deficiency. Exposure to naphthalene is more harmful for these people and may cause hemolytic anemia at lower doses. When the US National Toxicology Program (NTP) exposed male and female rats and mice to naphthalene vapors on weekdays for two years, male and female rats exhibited evidence of carcinogenic activity based on increased incidences of adenoma and neuroblastoma of the nose, female mice exhibited some evidence of carcinogenic activity based on increased incidences of alveolar and bronchiolar adenomas of the lung, and male mice exhibited no evidence of carcinogenic activity. The International Agency for Research on Cancer (IARC) classifies naphthalene as possibly carcinogenic to humans and animals (Group 2B). The IARC also points out that acute exposure causes cataracts in humans, rats, rabbits, and mice; and that hemolytic anemia, described above, can occur in children and infants after oral or inhalation exposure or after maternal exposure during pregnancy. Under California's Proposition 65, naphthalene is listed as "known to the State to cause cancer". A probable mechanism for the carcinogenic effects of mothballs and some types of air fresheners containing naphthalene has been identified. US government agencies have set occupational exposure limits to naphthalene exposure. The Occupational Safety and Health Administration has set a permissible exposure limit at 10 ppm (50 mg/m3) over an eight hour time-weighted average. The National Institute for Occupational Safety and Health has set a recommended exposure limit at 10 ppm (50 mg/m3) over an eight hour time-weighted average, as well as a short-term exposure limit at 15 ppm (75 mg/m3). In China, the use of naphthalene in mothballs is forbidden. It is due partly to the health effects as well as the wide use of natural camphor as replacement. However naphthalene is widely produced for moth balls and currently exported from China. 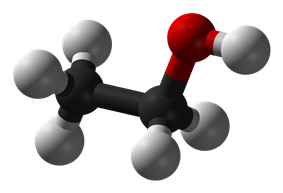 ^ a b c "Ambient Water Quality Criteria for Naphthalene" (PDF). http://water.epa.gov. United States Environmental Protection Agency. Retrieved 2014-06-21. ^ a b c d e f g h i j k l m n Lide, David R., ed. (2009). ^ a b c Anatolievich, Kiper Ruslan. "naphthalene". http://chemister.ru. Retrieved 2014-06-21. ^ a b c d e f Seidell, Atherton; Linke, William F. (1919). Solubilities of Inorganic and Organic Compounds (2nd ed.). New York: D. Van Nostrand Company. pp. 443–446. ^ "Thermal Conductivity of Naphthalene". http://www.ddbst.com. DDBST GmbH. Retrieved 2014-06-21. ^ "Dynamic Viscosity of Naphthalene". http://www.ddbst.com. DDBST GmbH. Retrieved 2014-06-21. ^ a b c d Douglas, Bodie E.; Ho, Shih-Ming (2007). Structure and Chemistry of Crystalline Solids. New York: Springer Science+Business Media, Inc. p. 288. ^ a b c d e f Sigma-Aldrich Co., Naphthalene. Retrieved on 2014-06-21. ^ "Naphthalene". Immediately Dangerous to Life and Health. ^ a b c "NIOSH Pocket Guide to Chemical Hazards #0439". ^ Amoore J E and Hautala E (1983). "Odor as an aid to chemical safety: Odor thresholds compared with threshold limit values and volatiles for 214 industrial chemicals in air and water dilution". J Appl Toxicology 3 (6): 272–290. ^ John Kidd (1821). "Observations on Naphthalene, a peculiar substance resembling a concrete essential oil, which is produced during the decomposition of coal tar, by exposure to a red heat". Philosophical Transactions 111: 209–221. ^ Emil Erlenmeyer (1866). "Studien über die s. g. aromatischen Säuren". ^ C. Graebe (1869) "Ueber die Constitution des Naphthalins" (On the structure of naphthalene), Annalen der Chemie und Pharmacie, 149 : 20-28. ^ Cruickshank, D. W. J.; Sparks, R. A. (18 October 1960). "Experimental and Theoretical Determinations of Bond Lengths in Naphthalene, Anthracene and Other Hydrocarbons". Proceedings of the Royal Society A: Mathematical, Physical and Engineering Sciences 258 (1293): 270–285. ^ a b Gerd Collin, Hartmut Höke, Helmut Greim "Naphthalene and Hydronaphthalenes" in Ullmann's Encyclopedia of Industrial Chemistry, Wiley-VCH, Weinheim, 2003. doi:10.1002/14356007.a17_001.pub2. Article Online Posting Date: March 15, 2003. ^ "Termite 'mothball' keep insects at bay". Sci/Tech (BBC News). April 8, 1998. ^ Daisy BH, Strobel GA, Castillo U, et al. (November 2002). , a novel endophytic fungus"Muscodor vitigenus"Naphthalene, an insect repellent, is produced by . Microbiology (Reading, Engl.) 148 (Pt 11): 3737–41. ^ "Interstellar Space Molecules That Help Form Basic Life Structures Identified". Science Daily. September 2008. ^ "Mothballs in Space". Astrobiology Magazine. Retrieved December 25, 2008. ^ K. Komatsua, Y. Murataa, N. Sugitaa, K. Takeuchib, T.S.M. Wan (1993). "Use of naphthalene as a solvent for selective formation of the 1:1 diels-alder adduct of C60 with anthracene". ^ M.A. Filatov, A.V. Cheprakov (2011). "The synthesis of new tetrabenzo- and tetranaphthoporphyrins via the addition reactions of 4,7-dihydroisoindole". ^ "Summary of Possum Repellent Study". ^ Santucci K, Shah B (Jan 2000). "Association of naphthalene with acute hemolytic anemia". Acad Emerg Med 7 (1): 42–7. ^ "NTP Technical Reports 410 and 500". NTP Technical Reports 410 and 500, available from NTP: Long-Term Abstracts & Reports. Retrieved March 6, 2005. ^ "IARC Monographs on the Evaluation of Carcinogenic Risks to Humans". Monographs on the Evaluation of Carcinogenic Risks to Humans, Some Traditional Herbal Medicines, Some Mycotoxins, Naphthalene and Styrene, Vol. 82 (2002) (p. 367). Retrieved December 25, 2008. ^ "Scientists May Have Solved Mystery Of Carcinogenic Mothballs", Physorg.com, June 20, 2006. ^ "Mothballs, air fresheners and cancer". Environmental Health Association of Nova Scotia. Environmental Health Association of Nova Scotia. Retrieved 24 May 2013. ^ Alderson, Andrew (15 Nov 2008). "Holy straight bananas – now the Eurocrats are banning moth balls". The Telegraph. Retrieved 2013-11-23. ^ Gray, Kerrina (17 November 2013). "Council warned against use of poisonous moth balls". Your Local Guardian (Newsquest (London) Ltd.). Retrieved 2012-11-23.